Genetically modified organisms (GMOs) are a controversial topic. Proponents claim that GMOs are revolutionizing the way we grow food and will help decrease poverty worldwide. Opponents believe that GMOs are dangerous not just for human consumption, but the effects they have on non-GMO crops near the GMO fields are devastating. Furthermore, detractors claim that the big GMO corporations are not interested in human health, but profits. The GMO argument is here to stay; GMO products fill the shelves of supermarkets. GMO experiments are suitable for science students at all levels; GMO is and will continue to be a part of their lives. BioBus Educational Programs created this experiment for high-school science students. It involves two distinct stages. The first has the students engage in a pre-laboratory electronic PCR (polymerase chain reaction) study in which they use the online BLAST (Basic Local Alignment Search Tool) program to create the primer sequences used during the actual lab experiment. The first step helps the students better understand the general concepts of a PCR reaction and identify the DNA sequence amplified with their PCR primers. The second stage takes a minimum of two days, so sufficient class time is necessary. The students perform their own PCR experiment with soy protein. The steps involve isolating DNA from the soy protein, setting up a PCR reaction, amplifying the strands and observing. Are We Eating Genetically Modified Papaya? As of 2011, there are no labeling requirements in the United States for GMO products. So, a suitable experiment for students is the testing of different foods to see if they are indeed GMO. The experiment tests imported Hawaiian papaya seeds, though you can use any papaya. The project is suitable for middle-school aged children and up. The student can study any number of seeds, the more the better, but the length of the experiment will depend on actual class time allowed. The student removes the papaya seeds, cuts them in half (use the seeds of one papaya per petri dish to keep track of the ones that have GMO seeds and those that do not), applies X-Gluc and phosphate buffer saline to the seeds. Over the next 24 hours, the X-Gluc chromogenic substrate that will show color differences in the GMO versus non-GMO seeds. The better a student or researcher can extract DNA from a specific product, the better experiments they can perform. The DNA-extraction experiment uses a range of household detergents to see which particular product extracts the most DNA from peas. The student can use any common detergent, but it is best done with detergents that have different chemical compounds such as X-14 cleaner, Ultra Joy and others with differing strengths. Blend the peas with a solution of salt and warm water. Strain out the cell material, add two teaspoons of detergent, one tablespoon of alcohol and a reactive enzyme to purify the DNA. Let the solution sit for about 24 hours, observe and have the student record her results. Different parts of plants yield more DNA samples than others due to their cell structures. This experiment seeks to test which part of the plant will give a student researcher the most DNA strands that they can later work with. The experiment requires a number of materials including a hot plate, blender, thermometer, ice bucket, 95-percent ethanol alcohol, liquid dishwashing detergent, protective plastic gloves, plant material (separated into distinct parts of the plant) and more. The plant material is blended, separated, cooled and mixed with the DNA extraction agents over the course of 24 hours. The experiment is most suited for high-school students due to the complexity of the steps and required detail of observation. 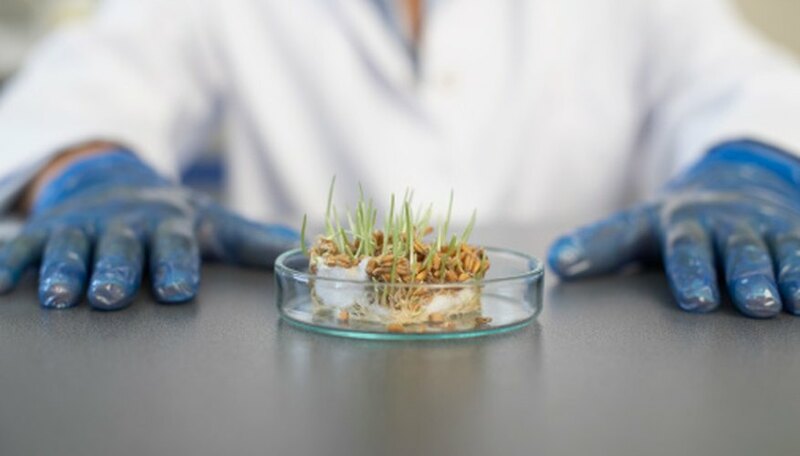 At the completion of the project, the student will have a greater understanding of the best plant parts to use for DNA extraction, enabling him to do further work in GMO and other plant-based research more effectively. University of Southern California: Are We Eating Genetically Modified Papaya? Charles Roe started writing in 2009, specializing in technology, history, education and travel writing. His articles appear on eHow, Trails, Answerbag and other Web sites. Roe has a Master of Arts in history from the University of Cincinnati and a Diploma of English Language Teaching to Adults from Cambridge University. Roe, Charles. "GMO Experiments." Sciencing, https://sciencing.com/gmo-experiments-8642846.html. 25 April 2017.